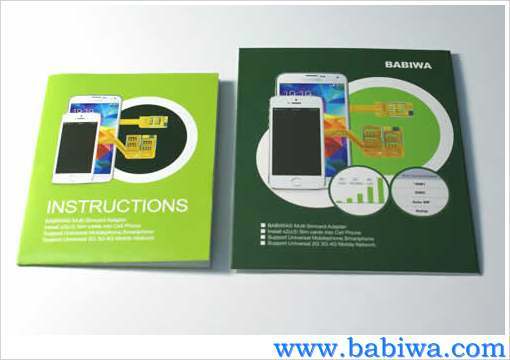 Newest BABIWA© Q series Three(Triple) Sim Card Adapter Supporting Samsung Galaxy Note III 3 Series Mobile Phone, or called N9005 N9006 N9008 N900x etc in some other areas. 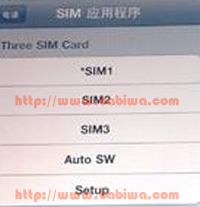 (Support Any Universal or Worldwide Version).Non-Cutting Type.Let your samsung galaxy Note 3 install three simcards . The only Genuine Supplier now ! 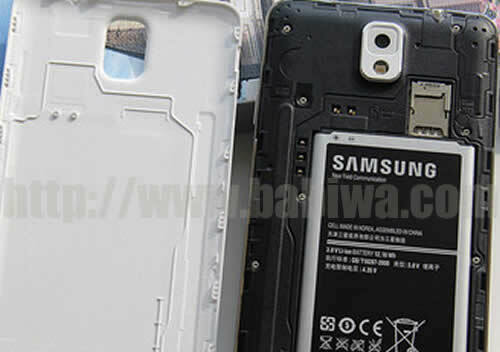 and Of course you can use only 2 sim cards within this triple adapter so you get two sim cards installed in your Samsung Note3 and just leave the adapter's third simcard slot empty. 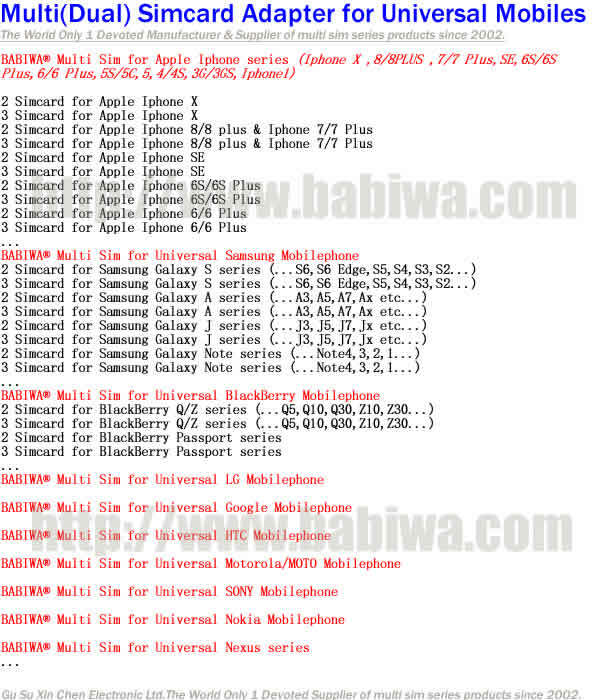 *Notice: Newest Firmware version 3.0 .The Only Genuine Version from the market which could Support 4G FDD-LTE 3.5G HSDPA and 3G WCDMA UMTS 2G GSM EDGE GPRS network. 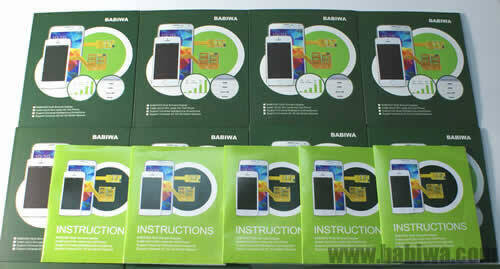 A Must-Have Interesting Accessory for Samsung Note III 3 Series Mobile Phone. Unique Design !! Let your Samsung Galaxy Note 3 III series Mobile phone Get Three Call Numbers for your Free Choice Conveniently and Easily without the trouble as power on off or remove battery to change sim card as before!.you get Three sim cards(one original Smaller Micro sim card and other Two Simcards)installed in your Samsung Galaxy Note 3 at the same time and switch freely on the fly. 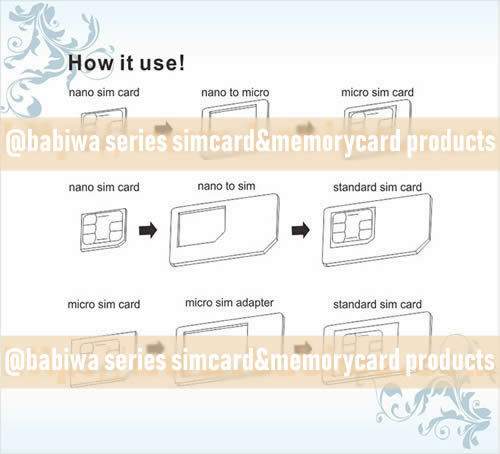 In addition to the original Micro Simcard,You can add other Two additional Sim cards into this adapter . 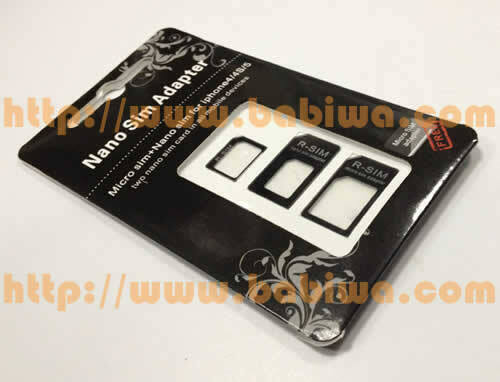 (The 3in1 Micro-sim Nano-sim Normal-sim Converter" also provided in the package for free since 2013) and switch to any one number freely on the fly. 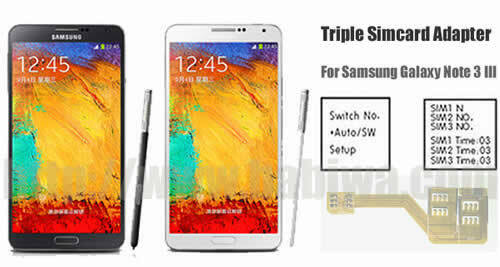 Very simple operation, Easy Plug & Play to Let your Samsung Galaxy Note 3 get Three SIM Cards available in single one mobile phone within seconds. Three numbers will be displayed on your screen by embedded application(you don't need to install any software).You can Choose Which number to use from that embeded menu manually or Let Three Numbers Switch Automatically by Setting up Auto-Switching time from embeded menu. 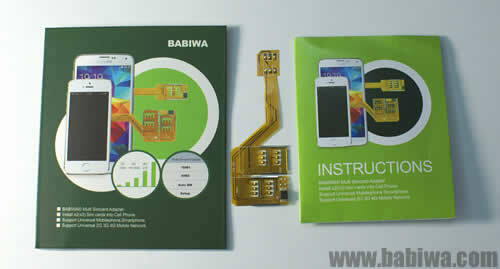 Please Notice this is the Genuine BABIWA© Q series Triple Adapter Product released from Patient Owner,Not the Common Fake products Easily Found in the Market. The priceWelcome to order samples from our online store (Babiwa online store since 2002 ,free shipping to worldwide area) . 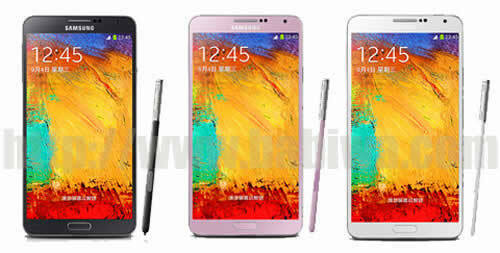 Samsung Galaxy Note 3 Series with Micro Simcard Slot. Triple Sim Card holder Supporting Samsung Galaxy Note III 3 Series Mobile Phone, or called N9005 N9006 N9008 N900x etc in some other area. Newest technology to let your own mobile phone to install three sim cards -- You don't need to power on and off the mobile phone to switch the three numbers(sim cards),just switch SIM(3 phone number) online through embedded STK MENU .And the "AUTO SWITCH"feature enable you to Set Three sim cards to be online automatically .please notice you can conveniently choose any one number online upon your free choice. you can use only 2 sim cards within this triple adapter so you get two sim cards installed in your phone and just leave the adapter's third simcard slot empty. Special "Automatical Switching Mode" Updated,to let you easily Setup Automatical-Switching Time Length ,to let Three numbers switch online Automatically upon your choice! 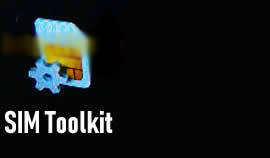 Any official Android version supported as long as your samsung note II could use the original Simcards normally.so if one sim card could be used in your phone normally,then it should be ok with our Triple sim adapter. Step 2:Push this adapter's sim1 end into your phone micro sim slot,make sure the sim1 end's bevel angle is at the same direction. Step 3: Then Push your simcard into your phone's Micro Sim Slot, make sure the adapter's Sim 1 End's front face(with six raised points) connects with your simcard's metal face.